Kahlua Nanaimo Bars - a celebration of a favourite liqueur & cookie bar! Kahlua Nanaimo Bars. A celebration of my favourite coffee liqueur and my favourite Canadian cookie bar. Perfect for the Holidays. I have tasted a coffee version of Nanaimo bars in my travels before and at first thought I would just add some espresso powder to the filling to get the flavour I wanted. Thinking that coffee can be an overwhelming flavour though, I decided a more subtle approach might work. After making a batch of Irish Cream Nanaimo Bars earlier in the week, I settled on a Kahlua version which would be a bit more complex in flavour. Since Kahlua is comprised of rum, vanilla bean and coffee, it was bound to be a more subtle coffee flavour. In my opinion it worked very well. With some Kahlua in the filling, and again like the Bailey’s version, a little in the chocolate top layer, the coffee flavour comes through without being overpowering. Again with this recipe I have included my new and improved base for these cookie bars. With what is essentially a thick buttercream frosting centre, I found myself wanting more of the chocolatey, nutty flavoured bottom layer to balance out the sweetness better. Let you nose guide you, the nuts will begin to smell quite toasty and delicious when they are done. They should also be hot enough that you would not pick them up with your fingers. If its not completely heated through, it isn’t properly toasted. 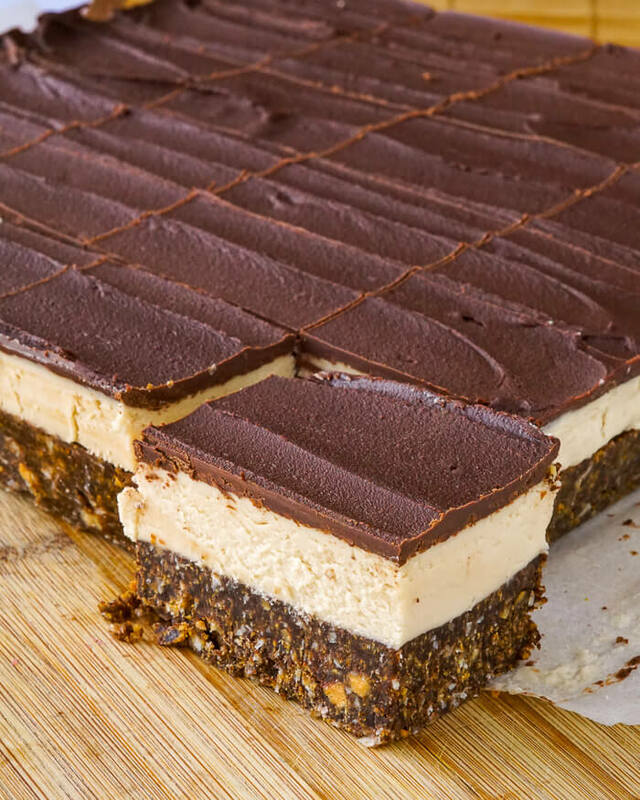 These Kahlua Nanaimo Bars are sure to be the hit of the upcoming festive season. Make them for your own cookie trays, give a dozen as a terrific hostess gift or make several batches for your annual Christmas cookie exchange. Wherever these show up they are sure to be an instant hit! 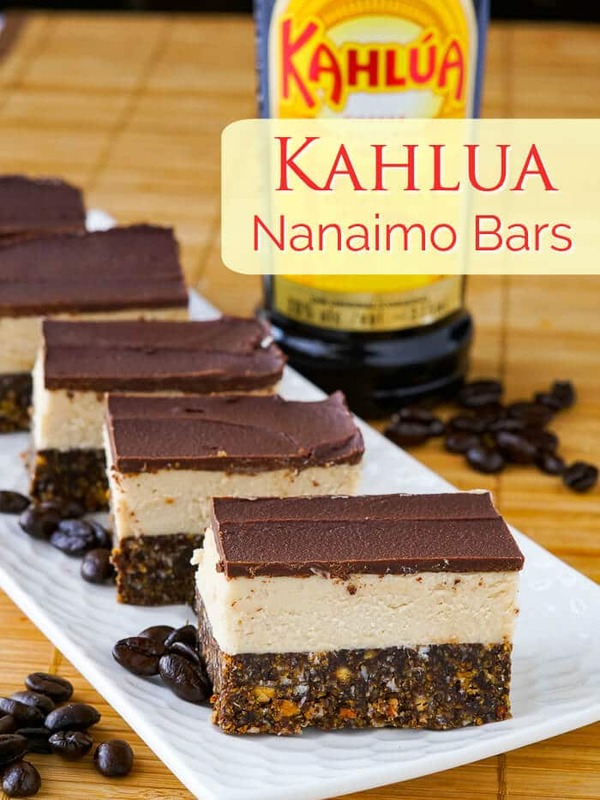 Like this Kahlua Nanaimo Bars recipe? 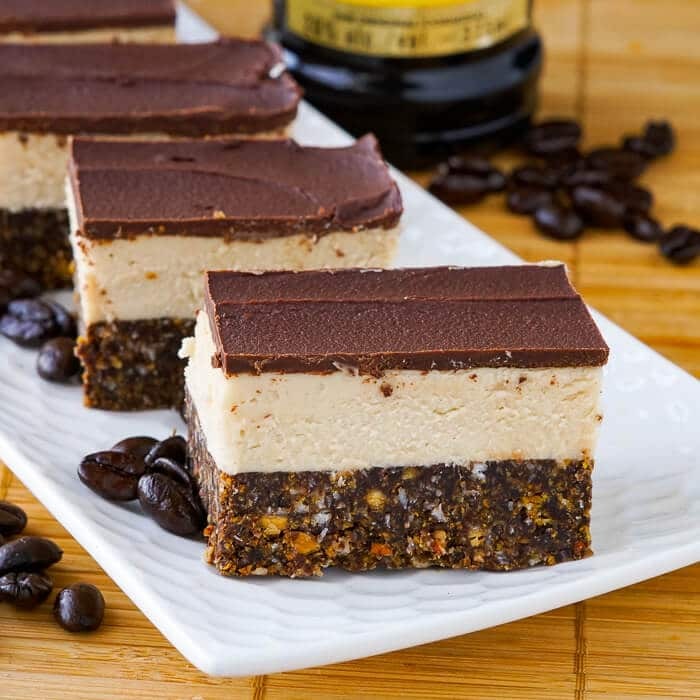 Kahlua Nanaimo Bars - a celebration of my favourite coffee liqueur and my favourite Canadian cookie bar. Perfect for the Holidays. With an electric mixer, beat together the butter, icing sugar and Kahlua until very smooth. This frosting should be very stiff but spreadable. If you think it’s too thick, you may add a few drops of Kahlua at a time to bring it to the right consistency. If it is too soft, add a little more icing sugar. Melt the chocolate chips and Kahlua together over low heat, just until the chocolate is melted, don’t over heat it. One of the other things worth noting in making Nanaimo Bars of any flavour is the choice of nuts in the bottom. I get asked questions all the time about substituting them. My answer is generally, "Use what you like." Since these are all no-bake cookie recipes, I think it is important to toast any nuts before chopping or grinding them finely to use in the recipe. The flavour will be so much better. Generally, most nuts like pecans, walnuts, hazelnuts and almonds will take from 7-10 minutes in a preheated 350 degree F oven. Lay them out in a single layer on a cookie sheet and toss once during the cooking time. Let you nose guide you, the nuts will begin to smell quite toasty and delicious when they are done. They should also be hot enough that you would not pick them up with your fingers. If its not completely heated through, it isn't properly toasted. 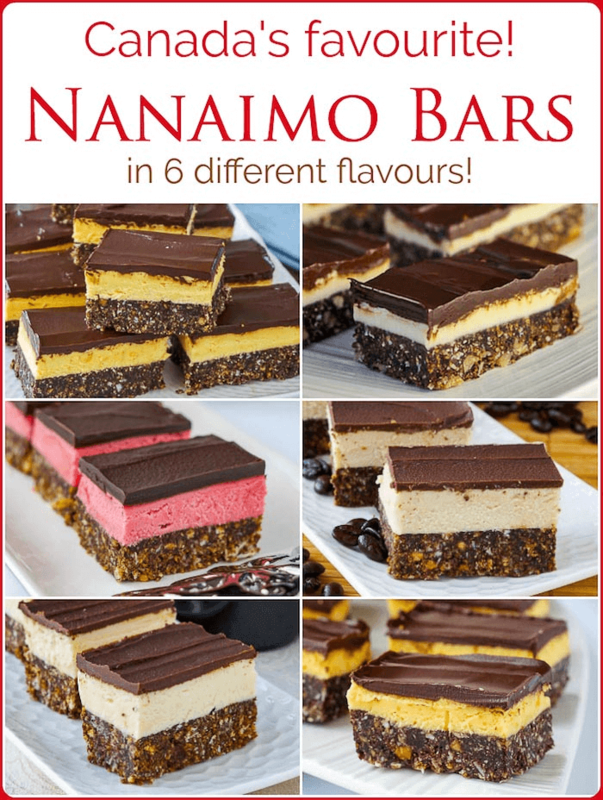 I just made these today and I have to say I think I like them better than regular Nanaimo bars! Will definitely be making these over and over again! Does this recipe not use custard powder because that’s what adds the flavour in the other recipe? No custard powder. We are going for a completely different flavour here. Adding it would be battling flavours.